What does the last sentence of Article 176 clearly say? “The legitime of each illegitimate child shall consist of one-half of the legitime of a legitimate child.” So how come these blogs and websites say that an illegitimate child will get exactly what a legitimate child will get by way of inheritance? 1. First divide the estate among them in the proportion of 10, 5 (10 — for each legitimate child, 10 — for the surviving spouse, 5 — for each illegitimate child) — PROVIDED that with this proportion, the legitimes of the legitimate children and of the surviving spouse are NOT decreased. (Reason: the intestate shares are either the SAME or GREATER than the legitimes; NEVER LESSER). 2. If said legitimes are impaired, just give the legitimes – and these will also be their INTESTATE shares. An algebraic way of presenting the example of Justice Paras is this: Let X be the amount of legitime for the legitimate child and X/2 be the legitime of the illegitimate child. Let’s say that the heirs are the surviving spouse, three legitimate children and one illegitimate child. Let’s say the estate (the totality of the property left by the deceased spouse) is Php 200,000.00. First of all, deduct 50% or Php 100,00.00 as the surviving spouse's share in the conjugal property. The remaining Php 100,000.00 will then be divided among the heirs (the surviving spouse is counted as one child). Let X be the amount of legitime for each of the legitimate children and the surviving spouse. Back in the early 1970’s, I lost my NSDB science scholarship in UP Diliman because I failed Physics 41 and Engineering Science I, and I barely passed Math 17. If you think my mathematical solutions are wrong, hey, feel free to comment! Please help. My father passed on five years ago. Our oldest brother passed on two years ago and has a child. theres one brothers older than I and a younger one. our parents properties and our mother wants to give it to us. does my deceased brother's child have a right to the properties? 1. Is your brother’s child legitimate or illegitimate? If the child is illegitimate, then he/she cannot inherit because of the “iron barrier” between the legitimate and illegitimate sides of the family. 2. Assuming your brother’s child is legitimate, the next question is, was the child already born at the time your father died? If not, then the child cannot inherit. If the child was already born at the time your father died, then he/she can inherit by right of representation. Im kinda confused, what is the dad is not signed on the birth certificate, will our loved child still inherit something from him? Aside from the birth certificate with the father’s signature, what are the other proofs that he has a child with me or with someone? Please avoid multiple posting. This makes things difficult for me. In terms of support, please read my post “Support for abandoned woman and child” (look for the link in the sidebar). The Family Code does not provide for a specific percentage. You will have to prove what the needs are, and the man is allowed to prove what his financial capability is. You can file a petition for compulsory recognition of your child as his illegitimate child coupled with a request for the issuance of a Protection Order for financial support. In the petition for compulsory recognition, you will ask the court to require the man and your daughter to undergo DNA testing. Please read my “DNA testing to prove legitimacy or illegitimacy of children; Supreme Court’s New Rule on DNA Evidence”. You will have to shoulder the costs for the DNA tests. If it is proven that indeed the man is the father, you can ask for reimbursement for whatever you have spent. In the sidebar, I listed down the names and contact information of government agencies and offices (NBI, PNP, DSWD, etc) from which you can ask for help. Contact these offices. 1. Can you please clarify on the prescription period within which illegitimate heirs/creditors may file for claim on the share of a deceased? What is the 2 year period based on? When does it start in cases of transfer/sale of real proeprties of the deceased? 2. Does the illegitimate child need to have the surname of my father in his birth certificate? Does the illegitimate child need to have the surname of my father in his birth certificate? Article 175 in relation to Article 172 of the Family Code provides for the ways an illegitimate child can prove his/her illegitimate filiation. Try to get in touch with the Legal Department of the NSO as to how you can obtain a copy of the birth certificate. The NSO might possibly require you to submit a notarized affidavit as to the reasons why you are seeking a copy of that birth certificate. Can you please clarify on the prescription period within which illegitimate heirs/creditors may file for claim on the share of a deceased? What is the 2 year period based on? When does it start in cases of transfer/sale of real properties of the deceased? I will presume that you are referring to the two year period provided for by Section 1 of Rule 74 Summary Settlement of Estates. Please read the Supreme Court ruling in the case of “Tan vs. Benorilao” G.R. No. 153820, October 16, 2009. (1) From the time the deed of extrajudicial settlement or sole adjudication was executed and notarized? (2) Upon the publication of the deed in a newspaper as required? (3) Upon the date of filing with the Register of Deeds? The Supreme Court ruling in Tan vs. Benorilao (citing among others McMicking vs. Sy Combieng) did not clarify this issue. My personal opinion is that the two year period will begin to run upon the date of the filing with the Register of Deeds. Please take note that the execution and notarization of the deed, and the publication in a newspaper both precede the filing with the RD. It is only with the filing of the deed with the RD that the heirs can distribute the estate. I have read the post on 172 FC on how to prove affiliation. Is it correct that everything has to be done while both parties (illigitimate child/parent) are still alive? I find it strange that all the requirement is a handwritten letter as proof from a parent. You go to any government office and they would require all sorts of documents with pictures as proof of identity and here they only need a handwritten letter. I just feel that anyone can write a letter and the burden lies in the legitimate heirs to prove that it is false? Isn't the burden supposed to be the reverse? The handwritten letter is supposed to have been written by the biological father. In law, we have what is called “admissions against interest.” Our courts give great evidentiary weight to admissions. By writing such a letter, the biological father makes an admission against himself, that is, he admits his paternity. Please read my post “Should the private handwritten instrument in RA 9255 be signed by the father?” (look for the link on the sidebar). Good Morning! Is a deed of donation a valid proof as claim for a property? If the donation and the deed have complied with all the legal requirements under Articles 725 to 773 of the New Civil Code of the Philippines, then the deed can be used as proof to claim the property in question. I am an illegitimate child. I am in my teens. My father recently died and when I looked up my birth certificate, there was a signature but no name of my father in the paternity section of the birth certificate. On the front page, father's information says "UNKNOWN" for all entries. I know who he is but I did not know about my birth certificate until recently. He sometimes visits us and provide financial assistance when he was able to do so. I would like to know if I still have any chance to get part of my inheritance even if there are no written public document as proof? Good day to you sir, I am now 30 years old and an illegitimate child. My story is a bit complicated, because my biological father did not sign my birth certificate, but his name was at my baptismal certificate. Since I was born I never had a chance to meet him, I knew where he lives and I even talked to my stepsister last April 2009, but my stepsister and my stepmother told me that his is not my father, that i came from different man, I don't know how to react on that. I don't want to ruin my fathers family, but I really wanted to meet him. Is there a possibility that I can talk to my father? Or is there's a Law that would fit my situation? My mother doesn't tell story about my biological father, but as for my self i just wanted to see him and just embrace him and feel the love of my own father. By signature, are you referring to the acknowledgment of paternity in the back of the birth certificate? If the name is discernible or can be seen from the signature, then you can use this to claim your illegitimate status despite the “”Unknown” entry in your birth certificate. 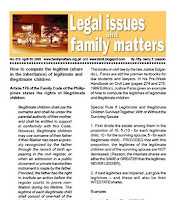 Article 175 in relation to Article 172 of the Family Code enumerates the different ways an illegitimate filiation can be proved. Please read also my post “Should the private handwritten instrument in RA 9255 be signed by the father?” (look for the link in the sidebar). Yes, I am referring to the acknowledgment of paternity section in the birth certificate.From the signature, you could not read the name. It is the usual signature that only has the first letter readable and the rest are just fast scribblings. There is no mention of my father's name on the birth certificate. Is it true also that once the person is dead, it is very difficult to prove paternity because all proceedings should have been done during the lifetime of both father & illegitimate children? Article 175 in relation to Article 172 of the Family Code provides the ways by which you can establish your illegitimate filiation. Please read also my post “DNA testing to prove legitimacy or illegitimacy of children; Supreme Court’s New Rule on DNA Evidence” (look for the link in the sidebar; read also the comments and my replies to the comments). Thus is how you feel towards your father but the question is, does he feel the same towards you? Please read my post “Can you legally force your spouse to live with and to love you?” (look for the link in the sidebar). While the Supreme Court decision dealt with a situation involving a husband and wife, the principle may also apply to parents and children. You cannot legally force your biological father to show you the same love you have for him. Like I said, there are other ways provided by the Family Code in establishing illegitimate filiation (Articles 175 in relation to Article 172). Please read also my post “Should the private handwritten instrument in RA 9255 be signed by the father?” (look for the link in the sidebar).